Waiting times at security check points at US airports rapidly get longer. The US Transportation Security Administration closed security checkpoints at airports around the USA the past weekend. The TSA is experiencing a national rate of 7.6% unscheduled absences compared to a 3.2% rate 1 year ago. The number of TSA security officers calling in sick increased by more than half. TSA employees missed their first paycheck on January 11, 2019. Those are some of the consequences of Donald Trump's government shutdown. 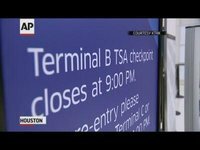 George Bush Intercontinental Airport shut down terminal B’s security checkpoint on January 13, 2019 due to staffing shortfalls. Thus, it redirects travelers to other checkpoints, where it will get busier. Miami International Airport shut down Concourse G for the same reason and also redirects passengers to other checkpoints, where the lines will get longer as well. The TSA is playing down the consequences of the government shutdown. It says that 99.1% of passengers waited less than 30 minutes on January 13, 2019, while 93.1% experienced a waiting time of less than 15 minutes. But having to work without pay does not motivate anyone. Thus, it can be expected that the longer the shutdown will last and TSA officers will not be paid, the longer the waiting times at security checkpoints will be. 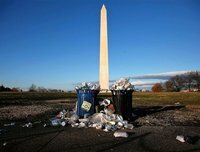 The shutdown is also causing a quickly mounting economic damage. S&P Global, a market intelligence firm, said last week the damage Trump has caused already amounts to $3.6 billion (€3.2 billion). Late next week it will have risen further to more than the $5.7 billion (€5.0 billion) that Trump wants to spend on his wall.